My adventure buddy, who has kayaked with me on nearly all the navigable water in Florida, is visiting me in Boulder CO. Unquestionably, that means I am going to initiate him in the art (danger?) of whitewater (rather than FL flatwater) kayaking. Fortunately, I have recently been fortunate to meet a new local friend who is a long-time veteran whitewater paddler in Colorado. In my recent experiences with him, I find that he is a patient, safe, knowledgeable instructor. I am thrilled that he is available to introduce my friend to the ins and outs of whitewater. We have breakfast at Foolish Craig’s on Pearl Street, then head to the Boulder Creek Playpark. 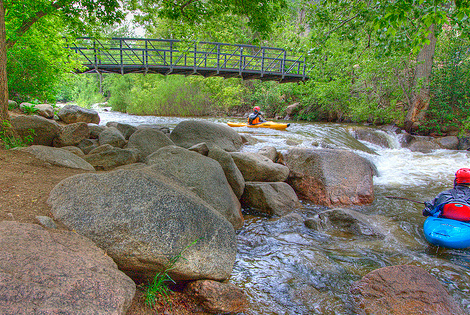 The park is ideal for beginner and intermediate whitewater kayakers. It starts with a rather intimidating-looking six-foot slide drop into a huge pool. We opt not to start out with that drop (or try it at all during our time at the Creek) during our initiation. The park also includes 4-5 other, smaller drops into smaller pools of water. As is my trademark, I spend most of the day successfully navigating the drops, and flipping upside down numerous times in the downstream eddies, which are treacherous for us new kayakers who make the mistake of relaxing and not paying attention to the dangers of this strong, swirling water. While the creek level is down considerably from just a few days prior, it retains a current that we Florida paddlers are not yet accustomed to. As I approach a drop on my first run, the surprisingly strong current whips my kayak around just at the precipice of the drop, and I am suddenly horrified to find myself unintentionally kayaking down this whitewater drop backwards. Despite my never having taken a whitewater rapid backwards before (and my extreme terror), I somehow am able to successfully negotiate it. I shout in triumph as I find myself unexpectedly upright downstream. The last drop is chillingly called “Widowmaker.” We successfully run it twice, then become grade school boys again by using the rope swing to plunge into the pool a few times. The creek begins along the continental divide and flows through the town of Nederland into Barker Meadow Reservoir, a water supply for the city of Boulder. From there it flows down Boulder Canyon and through downtown Boulder. After leaving the city, it flows Northeast into Weld County, where it joins St. Vrain Creek and ultimately flows into the Mississippi River and the Gulf of Mexico.